You’ve got to give the Mexicans credit. Despite years of hardship and oppression suffered under the rule of their conquerors, scandal and corruption of their elected officials that robs them of basic services, and more recently, slander and stereotyping by their northern neighbor, they still love to party. Nowhere is that more evident than in the UNESCO World Heritage Site city of San Miguel de Allende. This is not just a man walking up our street pounding on a drum. It is the beginnings of a parade. R waits anxiously in the background for the dancers. San Miguel, as it is known to locals, is a colonial city tucked into the highlands of Central Mexico. It is approximately a 4-hour drive north from Mexico City and is home to hundreds of parades, fiestas, processions, and festivals each year. Often these celebrations are meant to honor important religious or political figures or recognize some celestial event. However, sometimes it’s difficult to figure out just what all the drums, dancing and fireworks are about. No matter the reason for the celebration, though, it is hard not to get caught up in the excitement around the spectacle. June was representative of how San Miguel likes to party throughout the year. The Festividad de la Santa Cruz del Buen Caminos, celebrated just up the street from where we live, is similar to other localized celebrations that honor a church, saint or specific cultural reference that is unique to a neighborhood in the city. A parade was held each night in the days leading up to the main event. Sometimes it was directed up the street, but other days it was headed down the street. Each parade featured mock duels between people costumed in native Indian and Spanish colonial dress and followed by a man dressed in modern clothes. he typically carried a cross or a figure of the Virgin Mary. Drums, horns, and fireworks featured prominently too, of course. Many parades feature duels between natives and colonials. Hoping that history can be reversed, I always root for the natives. The religious history of Mexico is complex. The native tribes, including the Aztec and the Mayan, observed multiple gods, and often honored and appeased them with human sacrifices. Catholicism was introduced with the Spanish Conquest, and even though it is now the predominant religion in the country, it is easy to see - and hear - how the old belief system has been blended with the new. These costumes seemed to be a cross between the three wise men, representing the Catholic faith, and the feathered gods favored by the Aztec. Or it could have just been totally random. Most festivals begin with a burst of screaming rockets exploding in the sky. These fireworks are meant to chase away the evil spirits which might attempt to block the prayers of the faithful as they are sent to heaven. On the day of the full festivities of our neighborhood fiesta, the marching band sounded its first notes at six in the morning. Throughout the day we watched as Indians and Spaniards danced past our house and dueled it out in step to the beat of the pounding drums. Young boys with painted faces and outfitted with capes and horns wandered among the revelers while other children dressed in white were seated neatly in the bed of a pickup truck strewn with flowers. People in decorated robes and with carved and painted masks and feathered crowns followed behind a snake - perhaps representing the feathered serpent Quetzalcoatl, the symbol of fertility and life - draped over the tops of six children’s heads. And, to add levity, bringing up the rear - guys dressed in drag. I don't think words are necessary to describe this scene. But the focus of the spectacle was primarily religious. At one point, a woman holding a baby came on her knees up the cobblestone street and church steps to the altar. Her male relatives placed pieces of cardboard in front of her as she made her pilgrimage. When the sun went down, however, it was hard to discern any connection to religious purpose. Men paid 20 pesos each to try to shimmy up a telephone pole slathered in lard. At the top prizes were tied to a ring - bottles of tequila, a woven basket, a pair of shoes, a package of toilet paper. We were happy to see our plumber be the first to make it to the top. Finally, the fireworks. First came a man with a large wooden model of an airplane strung with firecrackers held like an umbrella over his head. He chased away anyone who dared to venture into his circle with a shower of sparks and a cacophony of exploding firecrackers. Most of the interlopers were children up past their bedtime. Parade participants kneel at a makeshift shrine erected outside the church while the priest broadcasts mass through a sound system for everyone - and I mean everyone - to hear.. The grand finale was lighting a tall tower - called el castillo - with a blow torch. The fireworks spin, hiss, and explode as they climb each level to the top where a lighted disc is ejected - spinning into the sky. It flew in the direction of our house and I wondered if I might find it on the rooftop terrace in the morning. 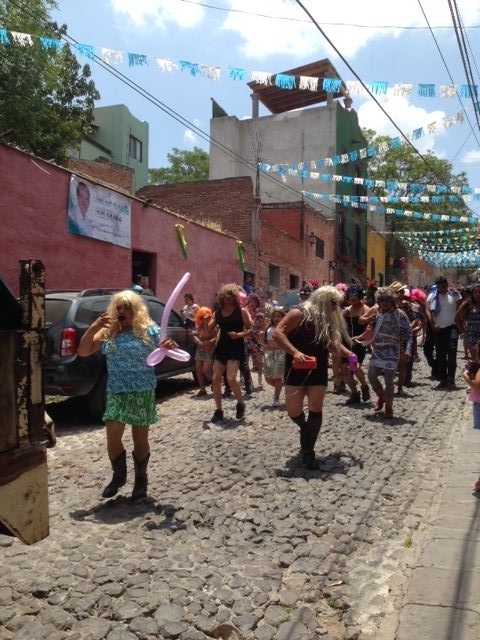 While the Festividad de la Santa Cruz del Buen Caminos is a local event, the following weekend the entire city turns out to celebrate the Los Locos (the crazy people) parade. This annual romp through the streets has roots in the city’s agricultural past. Each year, during harvest season, orchard workers were given a day to enter the orchards with their families, eat as much as they wanted, and dance in honor of St. Paschal - who was known to be very frugal with God’s bounty. Through the years, as the celebration became more of a spectacle, locals would gather to watch. As the crowds of spectators got larger and larger, the celebration became more showy - dancers would wear masks and carry live animals - and eventually, more organized. Giant mouse or cook with large head? It doesn't really matter at the Los Locos parade. Today, thousands of people come to watch and cheer as teams of crazies parade in elaborate masks and costumes ranging from roman warriors to popular Hollywood film characters to construction workers to baby chicks to scary clowns. Lots of scary clowns. The teams are organized by neighborhood. As they parade through town to the throngs of spectators, they toss candy to the crowd. People hold umbrellas upside down to catch the loot, and children and adults both run to gather the candy that has fallen to the ground. For my part, I leave the corn flavored lollipops sprinkled with chile where they have fallen. It’s a celebration reminiscent of Mardi Gras in New Orleans, minus the booze. Stores are prohibited from selling alcohol between certain hours on the day of the parade. But no one seems to mind. They know there will be another party next weekend.